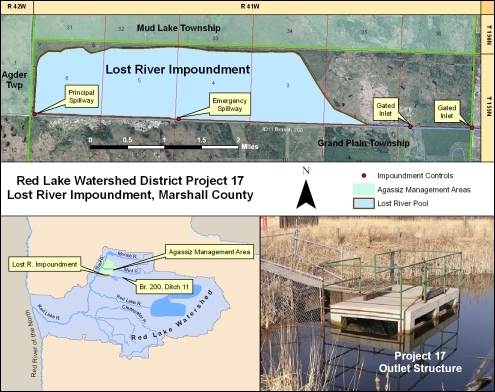 The Lost River Impoundment, Red Lake Watershed District Project 17, is located in Grand Plain Township of Marshall County, approximately 20 miles northeast of Thief River Falls. The 53.3 square mile drainage area above the impoundment structure consists primarily of flat agricultural terrain. The runoff from this area flows into Branch 200 of Ditch 11, and, depending on conditions, either flows into the Lost River Impoundment or continues downstream toward the Thief River. The Lost River Impoundment is a multi-purpose facility designed to increase wildlife values and reduce peak flows downstream by storing excess runoff. This "off-channel" design consists of approximately 10 miles of earthen embankment, an outlet control structure, an emergency spillway into Branch 200, and four 48-inch gated inlet culverts. When the water flowing in Branch 200 reaches a critical elevation, excess flow is diverted into the impoundment through the inlet culverts and spillway. The minimum critical elevation, normally 1146.2 ft. msl, is controlled at the principle spillway. The normal reservoir level (1146.2 ft. msl) is established with inflow through the gated inlet pipes. During periods of heavy runoff, when the water elevation in Branch 200 exceeds the highest spillway level (1148.2 ft. msl), it will flow over the inlet spillway into the inlet ditch. This flow will continue until the impoundment level reaches the same flow elevation as that in the Branch 200 channel. The Lost River Impoundment was originally funded and built in the mid 1970's by the Minnesota Department of Natural Resources. In 1978, the Red Lake Watershed District and the Department of Natural Resources agreed to modify the impoundment by raising the dike and spillway elevations, and extend the inlet channel. These modifications were designed to raise the normal pond elevation to provide more suitable habitat for waterfowl and to further lessen peak flooding in downstream areas. The cost of modification, in 1979 dollars, was approximately $109,000. A scheduled "drawdown" on the Lost River Impoundment began on November 7th of 2007 by removing the stop-logs and opening the screwgate on the outlet structure. The outflow from the Lost River Impoundment was transferred to the Elm Lake-Farmes Pool Impoundment, directly downstream , to restore the Elm Lake-Farmes Pool levels from an earlier drawdown on that facility. The Lost River pool area had become congested with cattail vegetation over many years. By drawing down the pool in the fall and re-flooding it in the Spring of 2008, more open water areas were created for the benefit of wildlife. The Minnesota Department of Natural Resources, in cooperation with the Red Lake Watershed District, performed the operation.